Steven Adler is back on his Guns N' Roses soapbox, this time saying he'd like to record drum parts for the Use Your Illusion albums to replace the existing Matt Sorum drum tracks. 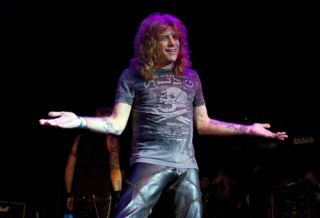 Adler told ReviewFix.com: "I did all the demo tapes, but for the album Use Your Illusion, 'Civil War' is the only song. You hear that song and when that song is over, you could tell it was a different band . . . And I would love more than anything if I could just do that whole record over again — just take all of Matt Sorum's drum tracks out and put my tracks in the way they're supposed to be. That would rule." The drummer also revealed the one thing that Axl Rose doesn't do well - tan. He said: "Axl gets this bad-rap crap. So he's made maybe one or two or three or four bad mistakes — he's done a million wonderful things. "People keep knocking him for the bad things. The only thing he doesn't do good is tan — and that's 'cause he's a ginger; gingers don't tan good."